Each delivery method will give the security, reliability and bandwidth that your business needs, and with guaranteed speeds and service levels, Ethernet connectivity from CloudM is the ideal solution. Your data demands are growing and you need the extra speed, security and reliability that Ethernet connectivity offers, or you need a point-to-point leased line, managed internet access or wide area network solution. 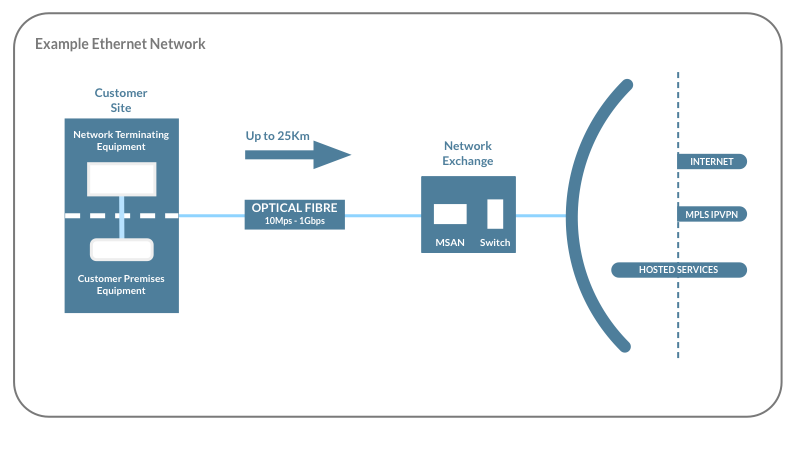 Ethernet over FTTC or General Ethernet Access (GEA) is where existing fibre or copper cable (if fibre is not available) connects your business to the nearest street cabinet, and a dedicated Ethernet line carries data to the CloudM core network. CloudM has a Ethernet over FTTC solution that guarantees symmetrical upload and download speeds of up to 19Mbps, with unlimited data usage and a 8 hour fix time. A high velocity hybrid solution that gives you the speed and bandwidth of Ethernet with the cost benefits of our FTTC and FTTP solutions. You have up to 20 users, want a cost-effective way to enjoy the benefits of Ethernet and your business location has the required capability. Where Fibre Ethernet is not available or would be too expensive to install, CloudM EFM provides an end-to-end Ethernet solution using multiple copper wires to connect your premises directly to the Ethernet core network. The dedicated, uncontended connection provides a high symmetrical bandwidth. A high speed, dedicated and fully managed connection, ideal for the smooth running of real time applications like video conferencing and VoIP where fibre is not an available option. This end-to-end fibre solution offers unparalleled levels of reliability and speed. It can be implemented in most locations regardless of whether or not fibre is currently available. Speeds of 1Mbps to 10Gbps and low latency ensure that the most demanding real time applications can be handled with ease. CloudM options include our highest service levels (99.93% availability), a seven hour circuit fix and four hour Customer Premises Equipment (CPE ) replacement service. A secure, totally managed service capable of dealing with large numbers of users and any high bandwidth cloud based applications. Your business needs complete control of your connectivity at all times, and any loss of service would have a major financial or operational impact. CloudM Point-to-Point Leased Line solutions are perfect for connecting offices in different locations, ensuring your data is more secure and network performance is more reliable. CloudM’s Wide Area Network solutions utilise MPLS technology to link together offices, data centres, remote workers, home workers and disaster recovery sites, allowing servers and network resources to be used and shared effortlessly among staff. √ No restriction on private fixed IP addresses, making VoIP configurations more .